We don’t expect you to literally want a volcano creating havoc in your bathroom spewing molten lava all over the place, but if you can picture heat just like lava pouring over your towels then you have a good visual on the warming perks of having a Climastar bathroom heater with a towel warming bar hung next to your shower or bathtub. Towel warmers provide efficient, comfortable heat for most sized bathroom with the added benefit of warming your towels for a toasty, luxurious treat after a bath or shower. The first few steps out of warm water can be brutal and uncomfortable. You must move fast enough to wipe the chilling water from your skin as your teeth begin to chatter and you curse your skin’s automatic cooling response. Having a warm towel to wrap around your body is a great solution to that post shower chill and teeth chattering moment. A towel warmed by a Climastar bathroom heater envelops you in welcoming heat, never as hot as a volcano of course, but very soothing. 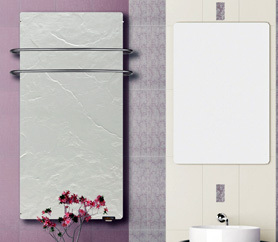 A wall-mounted heat with a towel warming rack offers easy installation and elegant design. Clearly we don’t wish a natural disaster to strike your bathroom, but having the warmth much like a volcano is a most welcome benefit after a long relaxing shower or soak in your tub. Heating systems for homes and businesses are faced with an increasing number of options to consider for their primary and secondary heating. While fire places and coal burning stoves become less popular, other alternative heating methods are quickly becoming more common. Traditional furnaces as a primary heating system are now being challenged from radiant baseboards, radiant floor heating systems and even radiant ceiling heaters. Many of these new heating systems are using electricity instead of natural gas or heating oil. Space heaters are also becoming a less expensive option to upgrading a poorly insulated home or to add supplemental heat to cold areas. Thermostone heaters and heated towel warmers from Climastar mount to a wall and are a couple of heating systems that have been commonly used in Europe for decades are now gaining acceptance in the United States. Many interior designers are adopting these electric heating systems as fashionable accessories to bathrooms, basements and home offices. A common challenge to traditional heating systems is the inability to zone your home for specific areas of the home without heating the entire home. Electric radiant heating systems can be easily designed to be independently controlled by zone which enables a home owner to increase the temperature for defined areas of the home during occupancy and conversely allows a particular zone to remain off during down times. This strategy not only saves the home owner money, it gives you complete control to efficiently warm you most used living spaces without comprising cost. Choosing the best heating system for a new home or to add supplemental heat to a cold spot in your home now takes a little homework. The radiant consultants and designers at Warmzone have been trained in all of the latest heating systems to properly assess your project and prescribe a system that will add value to your home inside of your budget. Contact us by phone or email to learn more about your home heating goals and we will sell you a heating system that works for you.